What a treat. 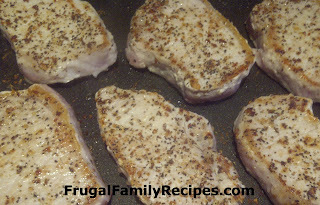 Thick, center cut, pork chops, on sale! Especially when the family has been sick for several weeks and we've been relying on easy to cook, "sick people" foods. You know, like baked potatoes, mac 'n cheese, etc. Anything really easy to make. I didn't want to waste these babies with overcooking (like in a crock pot), that would be tragic. Instead, I had more of a restaurant grilled chop in mind. With no barbeque grill and it being too cold to cook outside with pneumonia anyhow... what to do?! I thought about it for three days. Probably more a symptom of not being able to breathe than not knowing how to cook. I've been cooking since I was a young child; too many decades to count. Enough pork chop recipes to last a life time. But I didn't have energy to even look for a recipe. I wanted to just cook them perfectly, grill them (even though our grill is broken), and get it done QUICK. Next, for the grilled effect, I would cook them on the large electric griddle on our kitchen counter (an indispensable small appliance for a family of 6), with steak seasoning! Decision made and our delicious dinner was ready in about 45 minutes. In a separate bowl, whisk together soup and 1 c. water until blended well. Spread sauce over top of chops. Cover with foil and bake for 30 minutes. Serve with veggies and rice, spooning some of baked sauce over rice, if desired. YUM!! !